All five victims were passengers on the plane, officials said. 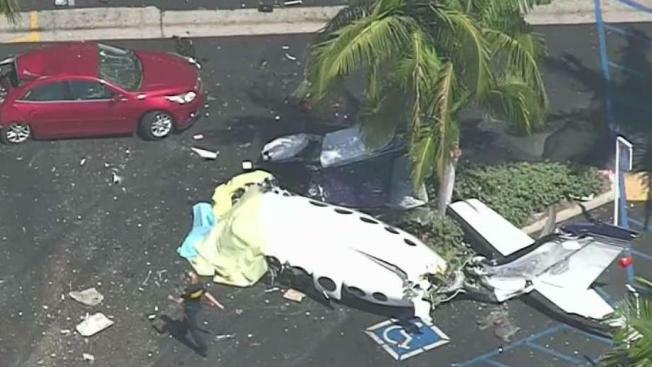 Five people died after an airplane crashed at a shopping center parking lot in Orange County Sunday, the Orange County Fire Authority said. The plane went down around 12:30 p.m. in the 3800 block of Bristol Street in Santa Ana, the OCFA said, adding that the Costa Mesa Fire Department was also responding to the scene. All five victims were adult passengers on the airplane, and no one on the ground was injured, OCFA Public Information Officer Tony Bommarito said. "It could've been much worse," he added. The Orange County Coroner released the names of the victims early Monday. They were identified as Scott Shepherd and Lara Shepherd of Diablo; Floria Hakimi of Danville; Navid Hakimi of Los Angeles; and Nasim Ghanadan of Alamo. All were passengers involved in the plane crash. The flight tower at nearby John Wayne Airport gave approval for the aircraft to land at one of its runways after the pilot declared an emergency, National Transportation Safety Board spokesman Peter Knudson said. Moments later, the plane crashed. At least one car on the ground was hit by airplane parts, with a red sedan showing extensive damage that included a broken windshield and a totally destroyed trunk. An OCFA crew was eating lunch nearby and responded within one minute, Bommarito said. South Bristol Street was set to remain closed from Sunflower Avenue to Macarthur Boulevard "probably though most of the night," he said. The 1973 Cessna 414 fixed wing aircraft is registered to Category III Aviation Corp in San Francisco, according to Federal Aviation Administration records. Bommarito confirmed that the plane originally took off from Concord in Northern California. The NTSB is leading the investigation into the crash, with the FAA providing assistance.